Ada Sibelius is raised by David, her brilliant, eccentric, socially inept single father, who directs a computer science lab in 1980s-era Boston. Home-schooled, Ada accompanies David to work every day; by twelve, she is a painfully shy prodigy. The lab begins to gain acclaim at the same time that David's mysterious history comes into question. When his mind begins to falter, leaving Ada virtually an orphan, she is taken in by one of David's colleagues. Soon after she embarks on a mission to uncover her father’s secrets: a process that carries her from childhood to adulthood. 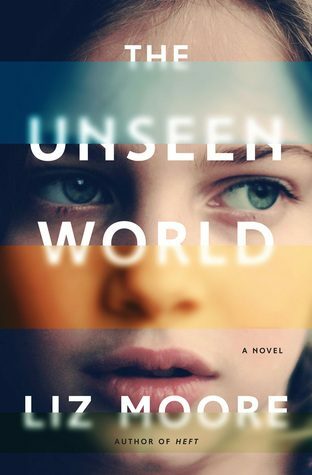 What Ada discovers on her journey into a virtual universe will keep the reader riveted until The Unseen World's heart-stopping, fascinating conclusion. I added this to my tbr in July 2016. I read the blurb and requested it from my library. By the time I started reading this (Jan. 2017), I had forgotten what the book was about which is how I like to start a story. If I was intrigued enough to put a book on my tbr, I try not to re-read the blurb before diving in. Unfortunately I was sick when I started this so it took me a while to get 10% (I try getting to this mark in one sitting before deciding whether to continue reading or go on to something else). By that time I had shed so many tears that I wanted to give up. The descriptions of the life of this little girl saddened me to a point that I did not want to continue. This was heart-wrenching. Maybe it was due to my illness but my money is on the story. So, I did something that I usually avoid – I went back on goodreads looking for a reason to go on(this sounds so dramatic). I read the beginnings of a couple of reviews and decided to keep going. I’m glad I did. I went on to shed more tears, some were even tears of joy. This turned out to be a beautiful story and a pleasant surprise. I cannot say enough about Ada, the MC. She was remarkably well written and while I have never been a teenage girl, I’ve had a few cousins and friends that were and I saw bits of them in Ada. Her behavior was believable based on her upbringing. My heart went out to her when she socialized with her peers, tried to be like them or was in the presence of a boy. I am a fan of mysteries and am usually good at figuring out the who, if not the why of a story but not with this one. I didn’t put much effort into figuring out who David was. I enjoyed the writing so much that I let the story come to me; and what came, I did not see coming. The writing is superb. Even with the feelings it elicited, I felt compelled to continue. It lulled me into a state of curiosity and a sense of security; I needed to know what happened next and that whatever occurred, it would be okay. I’m glad I ignored this. Ada and her story will stay with me for a long time. This is a fantastic review! I’ve not heard of this book but your review has made me decide to head to amazon and download a sample. Isn’t it interesting how some books pack such an emotional punch? Thank you Renee. I hope you like the sample enough to read the story. It is interesting, especially when I wasn’t expecting the punch. The writing had me connecting with and feeling for this young girl and I enjoyed every sob-filled blurry-eyed moment.